“Trees Are Key” podcast reaches 100,000 listens. 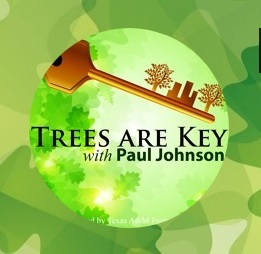 AUSTIN, Texas – Recently, our podcast, “Trees Are Key with Paul Johnson” celebrated a milestone. As of February 7, our free, weekly podcast has received more than 100,000 listens. “Trees Are Key” is hosted by Paul Johnson, Texas A&M Forest Service Community Forestry Program Leader. Johnson is a degreed forester, and an ISA Board Certified Master Arborist and Municipal Specialist qualified in Tree Risk Assessment and Wildfire Risk Reduction. Years in the making, “Trees Are Key” premiered on April 28, 2015, to provide an opportunity for interested listeners to learn on the go, even when they don’t have time to read up on forestry and arboriculture topics or attend a workshop. “We spend a lot of our time behind the wheel of a vehicle or exercising and cleaning. There’s no reason we can’t use that time to improve ourselves,” said Johnson. The first episode, “Why Trees Are Key,” is the most listened to the event to date. The podcast’s concept is simple. Trees are the key to healthier, happier and safer communities and knowledge is the key for the people that care for trees. Removing barriers to education and increasing access to information is vital for the people that care for and manage trees. On “Trees Are Key,” we talk about trees, arboriculture and forestry, both traditional and community forestry, with an emphasis on research-based information and best practices. You learn how to decide what kind of tree to plant in “Species Selection is Key,” which individual tree to select at the nursery in “Keys to Selecting THE Tree,” and how to plant your tree in “Proper Planting Is Key.” We don’t stop there, for example, you also can learn about proper watering, fertilization, and pruning. We enjoy the benefits our trees provide, but we have to manage and mitigate the risks they pose. The 3Rs, Readiness, Response, and Recovery, of emergency management, are essential topics in community forestry. Trees are important, but so are people. It’s important to raise awareness, build a tribe, and get everyone to collaborate to achieve our goal of healthy trees, so we have healthy and resilient communities. Personal and professional development are the keys to improving ourselves so we can be more efficient and effective. We try not to forget to have a little fun and even talk about Pokémon Go, movies and barbecue. Check out our latest episode “GIS is Key” or start from the beginning and quickly learn how to hire a tree care professional to help you and the 5 things trees need to thrive because “Trees Are Key” to healthier, happier and safer communities.